One of the unhappy facts of our day is the gap between evangelical Christianity and political action. 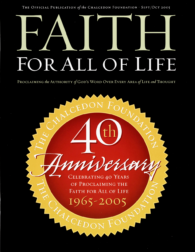 My father, Rousas John Rushdoony, formally launched Chalcedon in the summer of 1965. I was eleven years old at the time and our move from Palo Alto to Woodland Hills (in the suburbs of Los Angeles) was a memorable event. Typically, most historical accounts begin with the date and location of the birth of the founder. When discussing Christian Reconstruction this is not what’s important. Rushdoony would consider it irrelevant. The proper starting point is the birth of the ideas. I now live in the home my father, Rousas John Rushdoony, lived in for the last 26 years of his life. It is a photo album of days shared with a remarkable father and it holds many physical remnants of his life. The teacher who does not grow in his knowledge of his subject, in methodology and content, is a very limited teacher, and his pupils are “under-privileged” learners. Though he was a controversial figure in many circles, many defenders of the orthodox Reformed faith affectionately looked to Dr. Rushdoony as a father and teacher. On April 29-30, 2005, Chalcedon’s Communications Director, Chris Ortiz, and I attended Examining The Real Agenda Of The Religious Far Right at the CUNY Graduate Center in New York. I wrote “An Open Letter to Rousas John Rushdoony” twenty-five years ago for The Counsel of Chalcedon (May 1980). My appreciation for him remains unchanged. I was converted in a dispensational church and secured a B.A. in Bible from a dispensational college (Tennessee Temple College). I first met Rev. Rousas John Rushdoony in 1984 at a Christian conference in Denver after I had written Is Public Education Necessary? R.J. Rushdoony’s thought extends over an incredible range of topics, but his thought on law and economics has been the most helpful to me.